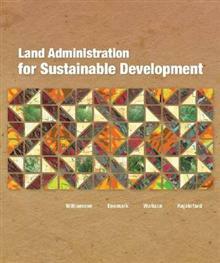 Land Administration for Sustainable Development examines global land administration systems at different levels of development. This examination elucidates how countries can establish basic infrastructure for the implementation of land-related policies and land management strategies that will help ensure social equality, economic growth, and environmental protection. Through its presentation of a holistic view of land management for sustainable development, this book outlines basic principles of land administration applicable to all countries and their divergent needs. 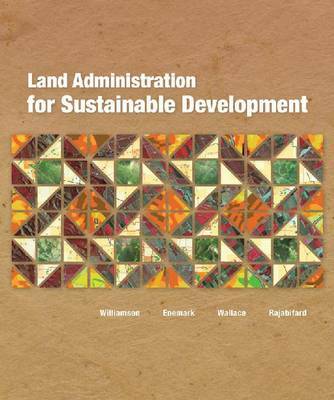 Land Administration for Sustainable Development is a resource for professors and students of land planning, land administrators, land planning managers, and government officials. Ian Williamson is a professor of surveying and land information at the University of Melbourne, Australia. Williamson has authored or coauthored more than 400 articles on topics of cadastre, geographic information systems, land administration, and spatial data infrastructures in both developed and developing countries. Stig Enemark is a professor of land management at Aalborg University, Denmark. Enemark is president and an honorary member of the International Federation of Surveyors as well as past president and an honorary member of the Danish Association of Chartered Surveyors. Jude Wallace is a land policy lawyer who is a senior research fellow at the Center for Spatial Data Infrastructures and Land Administration at the University of Melbourne. Her specialties range from improving the most modern land administration to developing pro-poor land strategies. Abbas Rajabifard is a professional land surveyor and chartered engineer, an associate professor of spatial data infrastructure, and director of the Center for Spatial Data Infrastructures and Land Administration at the University of Melbourne. Rajabifard is president of the Global Spatial Data Infrastructure Association.